The first mailout went yesterday with eight squares for Jen. 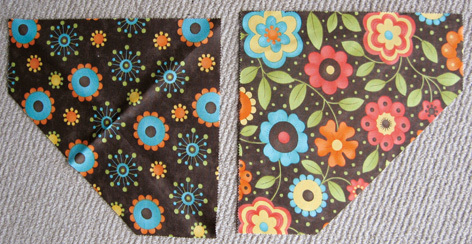 The brown, cream, blue and yellow fabrics come in an overall floral and leaf pattern and then a more isolated floral pattern. See below. It's very difficult to tell them apart. I made this mistake with one of my first squares, which I unpicked today and redid. Hopefully this will save you from doing the same thing! I made two squares at Tara's house today. Well two and half. Actually three but I had to unpick the 3rd one so many times it ended up being half by the time I had to pick Livy up from pre-school. SO if I can do it anyone can. They do take time but with a bit of good food or music/conversation round the place time passes quickly. Plus the colours and patterns are so beautiful you do feel inspired. Oh and Amy and Luc will love it! Kate, I agree the colours are beautiful and I'm sure Amy and Luc will love it.